EZ-ACCESSORIES® feature a line of quality packs & bags designed primarily for use with walkers, wheelchairs and bathing related products. 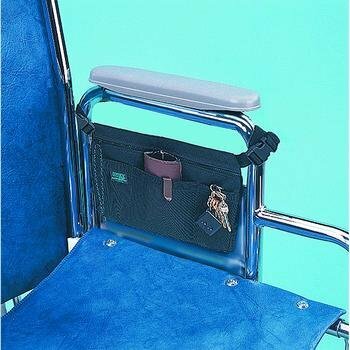 All EZ-ACCESSORIES® are for simple attachment to ambulatory aid devices and are intended to carry everything from oxygen tanks, portable telephones, keys, and even shampoo to the shower. Made of nylon and durable mesh, EZ-ACCESSORIES® packs and pouches are lightweight yet strong and designed to last! EZ-ACCESSORIES® are shipped in a high-grade poly bag with a zippered bottom for easy removal and re-insert of product. Includes 4-color package insert with product photo and description. Header card with grommet also included. Made of nylon. Black. All EZ-ACCESSORIES® are for simple attachment to ambulatory aid devices and are intended to carry everything from oxygen tanks, portable telephones, keys, and even shampoo to the shower. Made of nylon and durable mesh, EZ-ACCESSORIES® packs and pouches are lightweight yet strong and designed to last! EZ-ACCESSORIES® are shipped in a high-grade poly bag with a zippered bottom for easy removal and re-insert of product. Size: 8 1/2 x 9 x 1"